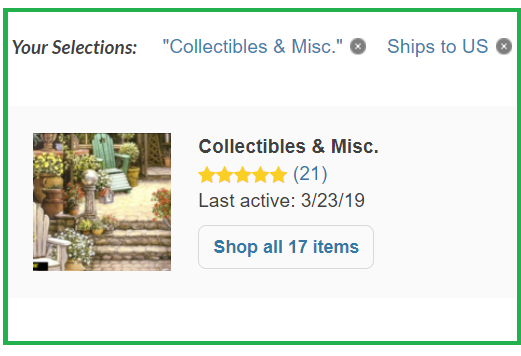 I’ve just searched for Your shop “CollectiblesMisc” and again for “Cloze_Loft”, also for my shop and for “It’s Your Turn” and “Shay’s Creations” booths. Out of these five, only Cindy’s and Shay’s are searchable, but “Cloze_Loft” is now closed, mine is on vacation, and Yours – since it is opened – should be searchable. So, You would need to ask B. support, if it’s a bug and Your shop is not indexed (?). I put a question mark, because Your items are searchable. all they differ only with listing numbers. And “Maras_Jewelry_Misc” (as it is the exact name of “Maras.Jewelry.Misc”) is searchable, so, maybe, this is the reason that the other one is not. As I wrote, You need to address it directly to B. support.